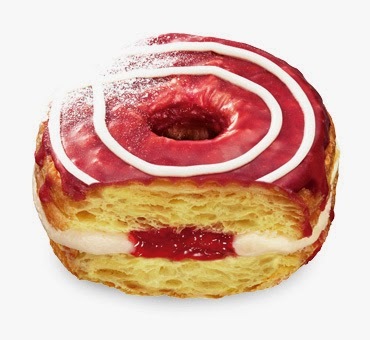 Mr Croissant Donuts are back with a new series of croissant doughnuts. 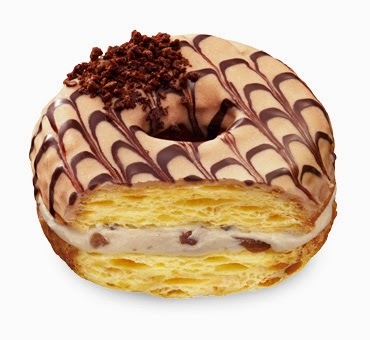 Earlier this year Mister Donut Japan released their first series of croissant doughnuts, which featured Chocolate and Custard Whipped Cream, White Chocolate and Caramel Whipped Cream and Maple and Angel Whipped Cream. 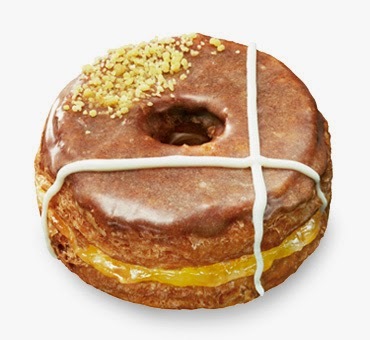 The doughnuts are made from croissant dough that is fried and then oven baked. 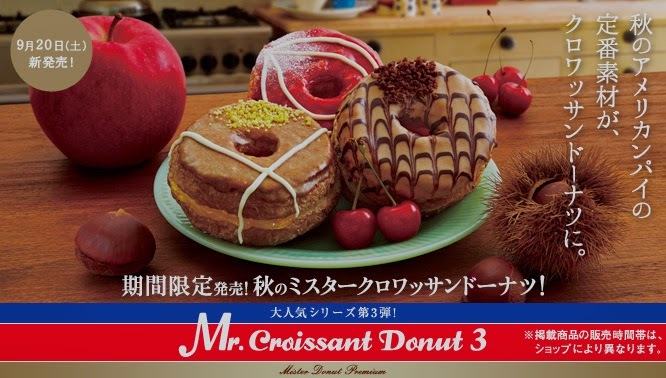 The donuts were a big hit with their very light and flaky texture so a new range has hit the shelves of Mister Donut across Japan. The new range features three new flavours; Apple & Custard Whipped Cream, Cherry & Cream Cheese Whipped Cream, and Crushed Marron Whipped Cream. 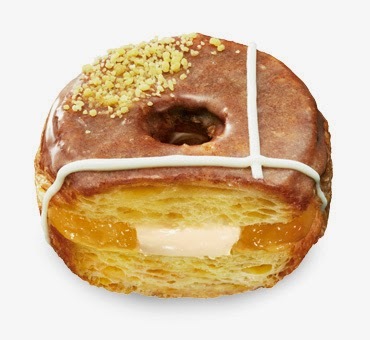 The doughnut contains apple and custard with a cinnamon glaze. It is available for ¥194 (USD$1.80). 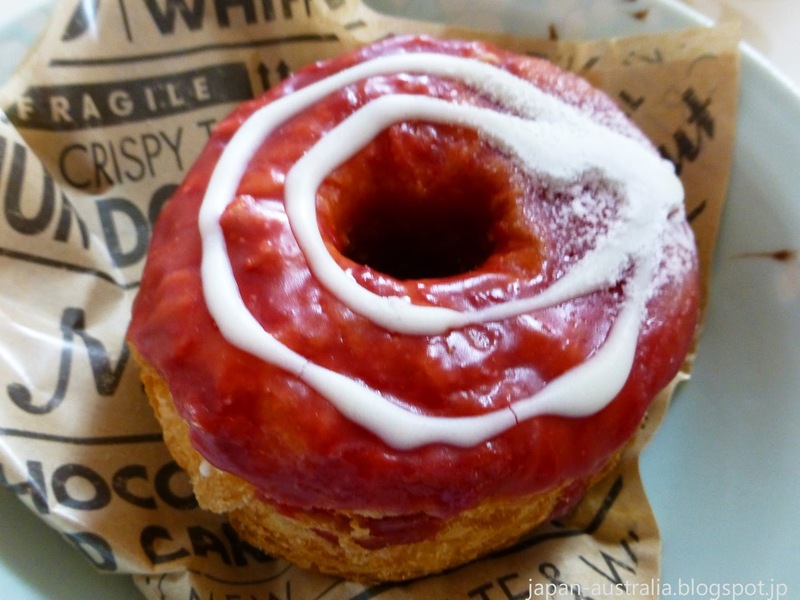 The doughnut contains cherry and cream cheese which is a fresh combination. It is available for ¥194 (USD$1.80). 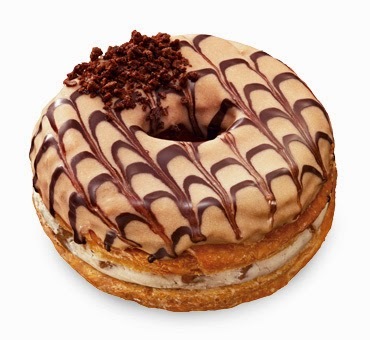 The doughnut contains crushed marron whipped cream with a marron chocolate coating. It is available for ¥194 (USD$1.80). We tried the Cherry & Cream Cheese Whipped Cream and were very impressed. 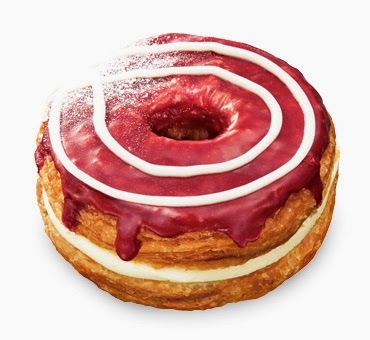 The sour cherry and cream cheese was an awesome combination and worked together really well. We will definitely be having this one again before these are taken off the shelf.